The Bake down Barriers message reaches Aylesbury mosque. This is a true story. Nicola (last name Dolan, if you want to Google her) is British but lives in the United Arab Emirates. Back in May, when the Manchester attack happened, she shared the horror felt by so many but, over in Dubai, was particularly alarmed by anti-Muslim posts on social media. Things got pretty nasty, as online dialogue so often can. So Nicola, a remarkable person and a great cook, started baking. The baking had a purpose. 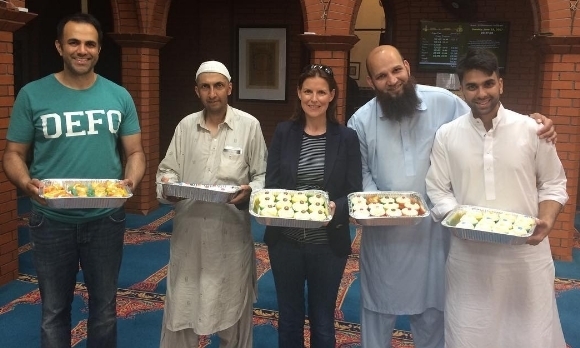 When her 12 little cakes were complete, Nicola gave them away to a Muslim family, in a gesture of solidarity. They appreciated the kindness, and she kept baking. A dozen cakes became 72, then hundreds, and then word spread and volunteers started getting in touch, joining in and adding hundreds more cakes and so many deserving recipients. Local newspapers and websites showed an interest and, when I saw her a couple of weeks ago, Nicola even spoke of being interviewed by a journalist based in India. It’s a movement now and she’s calling it Bake Down Barriers. On her visit to us here in Canada, Nicola recruited my daughter and the next day I found myself knocking on the door of a women’s refuge with a tray of 24 cupcakes. It felt good. The idea is simple: cook up a treat and give it to somebody who needs cheering up. That’s it. No politics or ideology or division. No conditions. No judgment. Do something unselfish and ask for nothing in return. This isn’t much of a column. There’s no insight here – except: “This is nice” – but I’m doing it, anyway. Maybe, as a result, a Courier reader will bake something and give it away. Cake, not hate. That’s an idea I can get behind.